The framing for the second floor goes at the same pace as the first. The panels are again set in place and nailed quickly by the work crew. The entire second floor goes up in a single day, with carpenters starting the stick-by-stick build of the front porch cover and other non-panelized items. The trusses (frame) for the roof arrive today and the start of the roof begins the next day. What Does the Term Stick Built Construction Mean? The term stick built construction means that the building is created over a predetermined spot or site. Because of this, stick built construction is referred to as on site construction. Meaning all the framing is built piece by piece. Other types of home construction are manufactured and modular. This type of home is made in factories and then delivered to the job site. The stick built construction, as the term implies, is a type of building technique that capitalizes on using "sticks" as the main structure of the house or other types of buildings. However, as time progressed, this term has been used differently. There were still some elements of this construction style that were retained. For example, the concept of the support system of the stick built construction remains the same. The house still has to depend on "sticks", which are later recognized as the main framework of the house. This is used to prevent the house from easily collapsing due to small quantities of tensile stress applied on it. The stick built construction procedure begins with the main framing. This is also known as the skeleton or the foundation of the house. Without this step, you will have difficulty in constructing the main parts of the house. As the jargon implies, this "skeletal part" of the entire construction process aids in giving the house its main shape. Aside from this, this portion also determines how much stress the house can take and how long it will last, based on theoretical principles. The frame is usually reinforced using the basic types of joints. For the roof framing of the house, the Birdsmouth joint is commonly utilized. This type of joint requires you to form an inverted V-shaped frame using two adjoined lumber. Another type of woodworking joint that is used for the framing of the house is the Dado joint. For most of the frames in stick built construction, this type of joint is used most of the time. Other types of joints that are commonly used for the frames of the stick built house are the Mortise and Tenon joint, Groover joint, and the Miter joint. The joints used for the frames can still be considered useless if used on their own. This is because the right direction and intensity of the force that can be applied to the house can be enough to make it collapse. To avoid this type of problem from occurring, it is best to roughen the lumber surfaces of the joints to be used to optimize their adhesion with one another. This will also help in preparing the surfaces for the application of wood glue. The heavy duty wood glue should be applied on both surfaces of the joints before they are combined to form a part of the house framing. Aside from this, it will be helpful if you attach additional reinforcements such as bolts, nuts, and screws to make the joints stay in place. 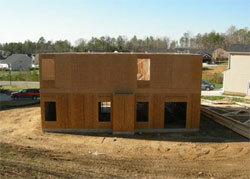 That way, the main framing that is used for the home construction process will be highly effective. This will also decrease the risk for accidents and waste of resources utilized for building the house. Choosing between stick built construction and manufactured or modular is a tough one. Modular homes can be built cheaper and faster, but over time, a stick built house will be stronger and hold its value longer.